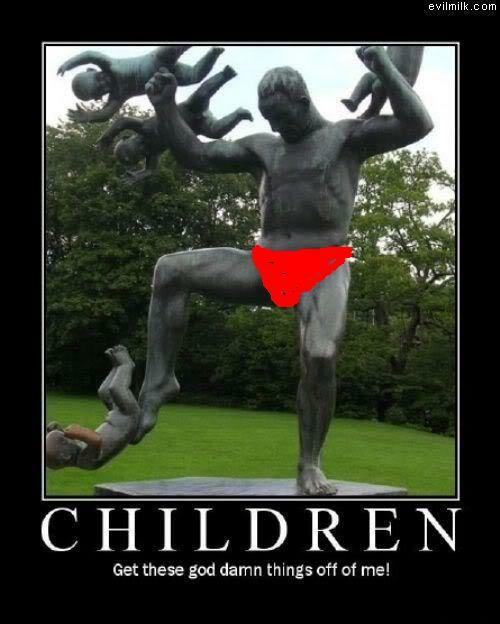 Children are not human! | Kimchi with Eish! t’s no secret that I am not entirely fond of this teaching gig! Now, there’s pretty much nothing I can do about it now, but if there is one valuable lesson that I am taking from this year in Korea it is to NEVER work with kids again. Well not kids, teenagers. I seriously think on your twelve birthday you get abducted by aliens and probed and that makes you an annoyance to humankind for the next 7 years! I really have to work hard on myself not to kill a kid everyday! The boys think they are extremely funny super-duper cool while the girls giggle and scream as if someone is permanently tormenting them with an invincible feather. Now it’s not that I did not expect it to be this way it’s just I don’t like them very much. I have never liked children. Even when I was a kid I had a great dislike for my peers. I don’t know why. And I must agree with Kathy Griffin, kids are way to needy and selfish. It’s true that to them it’s all about ‘me, me, me’. But luckily my fellow teachers here at ghetto middle school doesn’t have the faintest idea. Nope because every time I walk into the office I smile. It’s an inner peace kind of thing. Smile on the outside to try to keep the inner rage on the inner. It’s a constant battle. Now with the advent of fall no more widows are opened and it unmistakably smells like child and makes me want to faint! Oh well! unfortunately for Korea the majority of our impressions of this place are thanks to a bunch of snooty lil brats. We spend most of our time with kids and even my interactions with my coteachers are very limited because I placed the fear of god in them earlier this year. Oops! But I think for the most part these kids pretty much sum up Korea well. This week I had a lesson with my first grade (grade 7) kids about teenagers. I compared my school schedule to theirs. Of course they were shocked that I never attended an after school academy. Also the couldn’t believe that our school day starts at 7:30 and ends at 2:00. All of them want to move to South Africa. And I can understand why. These kids have absolutely no life. The go to school everyday (including every second saturday) from 8:30 till 4:05. Then they rush home for a bit and then they go to academy’s. Some of them stay there untill midnight. There they study math, science, English etc. It’s absolutely absurd. But they don’t have a choice, as 85% of Koreans attend universities resulting in the abundance of available skilled labourers and white-collar workers. You basically need a degree to work at the 7/eleven. Anyhow at the end of the lesson I gave them a bunch of words that they had to arrange in order of importance. The mos important words included STUDY, FAMILY, MONEY, LOVE, FREEDOM, FRIENDS, COMPUTER GAMES AND BEAUTY. The boys regarded money, family and freedom as the most important words, whereas the girls regarded beauty, love and money as the most important things. Most of them reached consensus on that Study is the least important thing to them, and by all means these kids are force-fed education even before they can walk! What came as a surprise to me was that many groups (especially all girl groups) ranked family as the leat important thing. Especially in this Confucius culture where family is the be all end all of things. But it goes to show that these kids want to free of a society that restricts them! Another project that I had a lot of fun with these mongrels was Global Warming. Even though they have covered the topic in Social studies and Science and Geography, I had to cover it in English. Yes the Koreans recycle and that is very noble of them put they are ninth on the list of the top 20 CO2 contributors in the world. I wanted to make them feel bad for the fact that I had to breathe in this disgusting air, but I wanted them to have a little fun on their guilt trip. So I had them make global warming posters and they did really well. Here are the winners from each class. That’s all folks, cheers from Kimchiland! ← And finally October is here!